Pocket doors are essential for closing off open sections at your office or home. They can also be applicable when you want to add a quick way to move from one room to another where a wall currently exists. Installing a pocket door saves you much-needed space as they disappear into a wall when opened. You can install a pocket door provided you have a combination of the right tools and expertise. Once you have the knowledge of how to install them, you will avoid the hassle of hiring a contractor. So what does installing a pocket door entail? This article highlights what pocket door installation entails, the tools and materials needed, and a step-by-step guide. What Is A Pocket Door Installation? Installing a pocket door entails putting in place a pocket door in your room. This allows you to pick up the usable floor and wall space that normally would be occupied by the swing of a door. While you may hire a contractor, it is possible you can do it yourself provided that you have the technical know-how and the right tools. You can buy and install a pocket door at home or in your office for as little as $100, and the kits are available at lumberyards and home centers. However, you will have to tear out a portion of your home to make room for the split studs that will replace the wooden ones and the door track that will facilitate the swing. The demolition of the existing wall can be messy, but it is straightforward. Before installing a pocket door, you need to understand the design and function of the pocket door. It slides in a metal and wood cage. Some traditional homes incorporated the use of pocket doors to create privacy and separate a living room from a parlor or dining room. The door disappeared into the wall when it was not in use, which saved a lot of space. The framing hardware within the wall’s cavity allows the door to slide in and out of the wall, which is a solution when wall or floor space is at a premium. Even though the hardware used for installing a pocket door can work on any type of door, including solid, hollow core, paneled, or flat, we recommend that you buy a pocket door hardware system that includes the pocket door. If you want to install a pocket door in your bathroom, consider a door with a mirror on one or both sides. You will need to find a pocket door frame hardware system for doors measuring 1 1/8 inches to 1 3/4 inches thick and 6 feet by 8 inches high. This system is an improvement from the old-fashioned door walls since it cannot stick or come off its tracks. The wheel assemblies roll in boxed tracks that prevent the door from derailing. The floor anchors help you to maintain a proper distance between the jamb studs, and the door slides center the pocket door as it glides into the open position. The pocket door locks are available in various finishes and styles and are usually designed with a recessed handle that folds flat against the door’s edge when it is in the recess position. You will need a pocket door kit, which costs about $100 and is available at lumberyards and home centers. Once you purchase your pocket door kit, read the instructions and directions before installing the pocket door. This is essential as it will summarize the installation process. However, although all pocket door systems are typically installed similarly, the manufacturer’s directions provide the best advice on the particular product and should not be ignored. Ensure that there is enough space on the wall. You need approximately twice the width of the door so it can hide. You should check whether the wall is a partition or load-bearing. If it is load-bearing, you will need a new header, and means of temporary support while you are working on installing a pocket door. You should check for wiring or plumbing. If the wall has pipes or is not in a good place to put a door, then it is not perfect for your pocket door. You can detect wiring with a cheap voltage sensor. Remove the existing door if applicable. If you are replacing a door with a pocket door, you need to get rid of the existing one. You should start by removing the molding and cut the shims with a reciprocating saw blade. Once you cut the nails, remove the door frame. The door jumps are not nailed against the suds; they are just spaced with wooden shims, so they are easily removed. Remove the drywall on one side of the wall. Ensure that you do this slowly to make sure you have missed no obstacles within the wall. Remove the drywall a few inches above where the header will be. However, ensure that you do not go all the way to the ceiling, as it can lead to more work later. Cut the exposed studs carefully. This creates room for the new pocket door framing. This step is easier if you use a small hand saw or a circular saw. Be careful not to accidentally damage the wall you did not cut away. The goal here is leaving enough holes in the studs so that the pocket door passes through. Since a standard pocket door measures 1.77 inches wide, you need to look for a pocket door kit that comes with split studs to make this step easier. First, make a new header. It is possible that your pocket door will require a header with a dissimilar height. The header’s height can be determined by whether you need a soleplate. If the floor covering above the subfloor is minimal, you need to secure the split-stud brackets directly to the floor. To determine the header height, figure the length of the new pocket door, plus 3 1/4 inches and the height of the soleplate if any. Once you determine the appropriate length, install the new stud this length from the existing one on the opposite side. Nail or screw the new header in place and then cut and fit the soleplate to the floor. Use a reciprocating saw to adjust the header which removes the partition header in place. Cut away the studs to make space for the framing. You should then cut the nails between the soleplate and the studs and then determine the height of the desired header before cutting the stud tops to length. Second, install the slider track. The kit contains the rails on which the door slides into the wall. Install the slider track according to the directions provided in the kit and screw the brackets into the studs. If you need to cut the track to length, use marks corresponding to the door size. Use a handsaw on the nailers and a hacksaw on the channel. Ensure that the rack is level. Third. Place the hardware and door into the slider track. You should ensure that the door slides easily and stays level by mounting hangers on the top of the door. Then slide the wheeled carriages into the track and hook the hangers. After this, adjust the assembly until the door hangs plumb and is in place. First, replace the drywall you removed at the beginning of your project with a new one. You will use panel adhesive and screws. Second, install the latch hardware. The kit comes with a door latch hardware. Some should be attached to the door and some on the wall. Make sure you follow the instruction provided in the kit. Third, finish installing the drywall. You can tape and mud the drywall. Ensure that you apply plenty of drywall compound and aim for multiple coats over every seam. You should embed tape in it to remove the excess compound. Allow it to dry and sand it and apply the next layer of the compound. After finishing, sand the drywall for a smooth finish. Fourth, paint or decorate the wall as you see fit. You should do this before installing the door trim. This way if your lines are not straight, the trim will cover them. Fifth, install the door trim. The trim hardware comes with the kit. You should install it according to the instructions provided in the kit. Screw or nail it to the jamb and the door studs. Installing a pocket door allows you to pick up the usable floor and wall space that is normally would be occupied by the swing of a door. You need to have the right materials, and the pocket door kit can be bought at lumberyards and home centers. The step-by-step guide has highlighted what you need to do when installing a pocket door. The major steps include making space for your pocket door, assembling the door and hardware, and finishing. In the finishing, use 6d finish nails to install the strike jamb casing. You should use shorter nails to install the pocket side casing of the door jamb to prevent damaging the door. We hope that this article has given you the confidence to get started on installing a pocket door of your own. 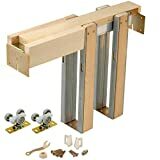 Hey Buddy!, I found this information for you: "Installing A Pocket Door: Easy Steps On How To Do It On Your Own". Here is the website link: https://www.explodedhome.com/installing-a-pocket-door/. Thank you.